Going on a shopping spree in Kamla Nagar? The heat’s bound to tire you out. Take a break, grab some delicious food and refreshing shakes at these restaurants. Living that broke student life? Phirangi is where you need to head. They’ve got amazing momos, pizza, pasta and the usual comfort snacks. We hear great things about their Farmer’s Pizza, Wrestler’s Omelette, and chicken momos. The interiors are all wooden tables and chairs, and made up of bottle caps, old switches, sockets and other quirky stuff. Famous for their signature shakes, mojitos and coolers, Bistro 57 is the perfect place to hit up when it’s scorching hot outside. You’ll find sandwiches, nachos, waffles and more to munch on here, but the spotlight forever remains on their chilled mojito variants (try the kiwi and peach). The Kit Kat shake is worth a try as well. 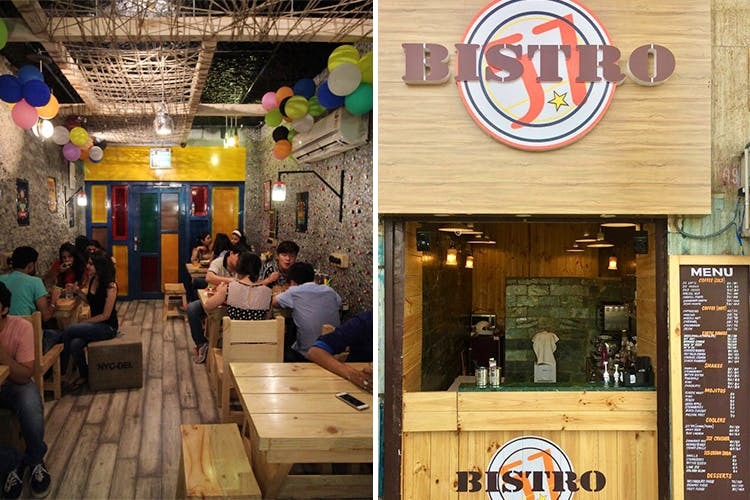 Our trusty go-to for amazing Oriental cuisine has an outlet in Kamla Nagar as well. Berco’s does some of the best Drums of Heaven we’ve ever had, Singapore Style Noodles you can’t get enough of, and dimsums that you wouldn’t want to stop eating. Chinjabi cravings? This is your pit stop. It’s our staple diet, Delhiites, so a list without a dedicated momo place would be in vain. Dolma Aunty Momos has been a crowd favourite for ages – the original Lajpat Nagar outlet, and then Janpath, till they finally came to the aid of North Campus students in search of the perfect momo. The classic steamed chicken momos here are iconic. Who doesn’t love a melt-in-the-mouth kebab? Our desi tastebuds appreciate being treated to amazing tikkas and (as the name speaks for itself) Tikka Junction knows how to do it just right. They’ve got tikkas made in the tandoor, tawa, and the kadhai, so you can be dead sure that variety isn’t a problem here.